Being able to use clean renewable solar energy for recreation and emergencies without any hassles or worries, now there’s an ultra-efficient power source right at your fingertips. Renogy group’s Lycan Powerbox is a convenient and clean energy solution in a small package that connected at all times. It’s a high performance, versatile charging portable and quiet with zero emissions and also has low maintenance. For years, Renogy has been providing its customers with high quality solar energy products. 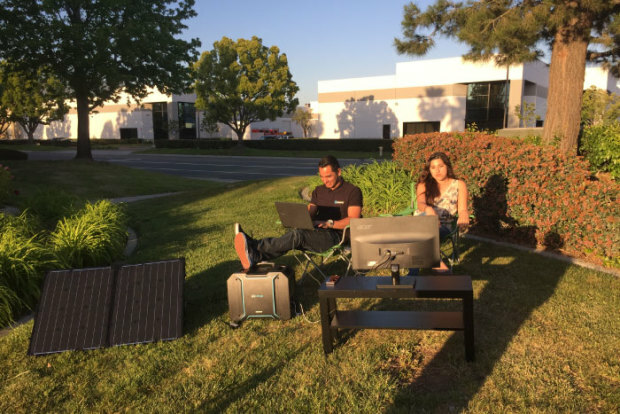 Within the past two years, Renogy has started manufacturing and selling an array of smaller off-grid solar and battery products, designed to take away the hassle and worry of venturing far off the grid without a traditional power source. The Lycan Powerbox may be charged in a wall outlet or with solar power, providing hours of charging capability and convenience. 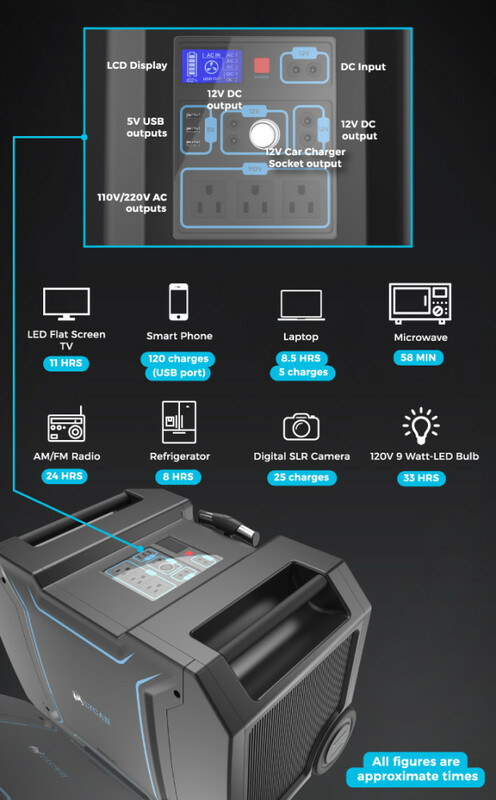 What makes the Lycan particularly unique is its replaceable lithium iron phosphate battery that will provide endless amounts of power so you can charge your frequently used or necessary electronics. It is intelligently designed for versatility. Whether you’re a stay-at-home mom, contractor, outdoor survivalist, or tailgater, this dynamic portable power source is perfect for all types of users. All figures are approximated charging times. Actual charging times may very due to various makes and models. It is truly a game-changing innovation due to the following features. 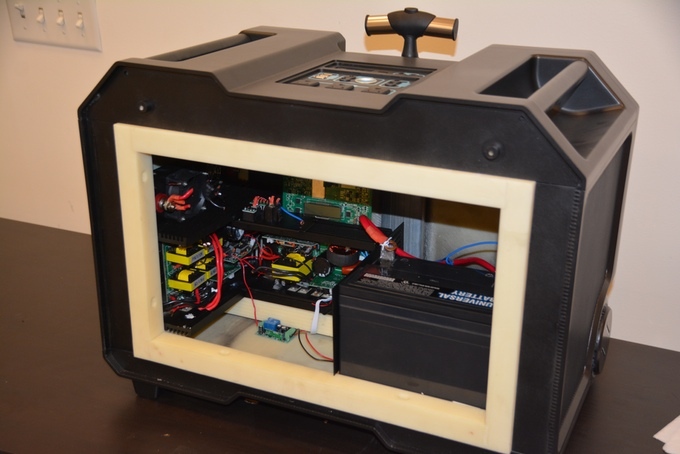 The Lycan Powerbox is a simple and valuable tool for any household. Once you charge your Powerbox through a solar panel or wall outlet, it’s ready to go. The box is a reliable and portable power source for any device, indoors or outdoors. Using 100 watt solar panels, you can fully charge The Lycan Powerbox in 9 hours with one solar panel, 4.5 hours with two solar panels, or just 3 hours with three solar panels. Or simply plug your Lycan Powerbox into a standard wall outlet to get a full charge in 7.5 hours. Renogy has spared no expense to engineer a superior lithium-iron-phosphate battery (a higher grade than the ones found in Tesla vehicles). For Lycan users, this means you get more cycles in the life of your battery—approximately 2000 cycles or more on average—and it’s able to hold a charge longer than traditional deep cycle batteries. The Lycan allows you to prepare a library of fully charged batteries for quick, hassle-free reloads. Now there’s no waiting hours to recharge the unit, and when the battery runs through its life cycle, you don’t have to run out and buy a whole new generator! With traditional deep cycle batteries, you are generally only able to use 50% of the claimed amp hours. This precaution is used by other portable chargers typically to preserve the life of their batteries. However, The Lycan’s battery gives you up to 10 times the battery life compared to standard deep cycle batteries. With the USB and AC/DC outputs, you can power several devices silmultaneously if needed. This campaign is live at Indiegogo and they have already achieved a whopping $25,300 against a goal of $75,000! Lycan Powerbox is currently available for pre-order at the discounted rate of $1449 (MSRP $1799 – cheaper if you get on the Indiegogo); the first 25 backers will receive Lycan Powerbox for the “early bird discount” pledge level of $1249. You can support this promising product at Indiegogo- help them to achieve the successful implementation of a green energy product.